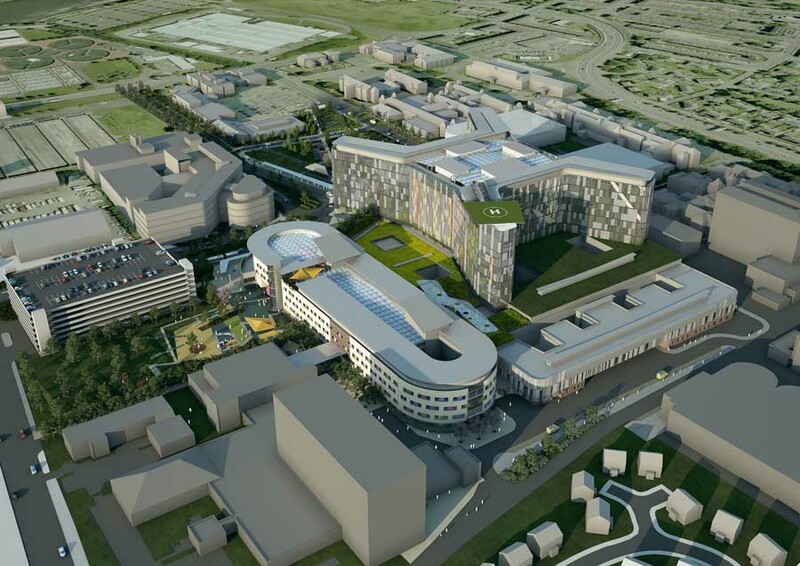 Glasgow is set to become a world centre of excellence for research into cancer, under pioneering plans by Reiach and Hall Architects for the University of Glasgow and Cancer Research UK. Planning permission has recently been unanimously granted and work on site is due to begin later this year for a projected completion of 2006.
facilities, accelerating the process of understanding the disease, identifying new therapies and bringing them to patients. affords almost complete separation from the existing building to both reduce the impact of construction work on the current research programmes and offer a bold, strong, individual visual identity for the new centre. The fundamental architectural concept of this project of three articulated blocks arranged around a triangular atrium remains unchanged from the original design competition winning submission. This concept is generated by a strong simple organisational (or parti) diagram which responds to a very specific user brief, Reiach and Hall’s initial masterplan strategy for the Western Court site, and the urban landscape of the West End of Glasgow. Site development strategy proposals are based upon a contemporary reinterpretation of the original urban grain and building scale prior to the early 1970′s major road re-alignment and demolition works. the collegiate arrangement of quadrangles and ‘inhabited walls’ exemplified by the Gilbert Scott main building. successful ‘gushett’ resolution found elsewhere in Glasgow’s West End exemplified by the Argyle Street/Sauchiehall Street junction. ‘object buildings’ sensitive and appropriate to their surroundings exemplified by the Round Reading Room, which Reiach and Hall recently refurbished for the University. The design synthesises these and other considerations into a bold but sympathetic piece of urban planning in which the new Wolfson Medical School performs a pivotal role. Within the proposed overall masterplan framework the new Medical School has a prominent setting at the apex of the triangular ‘gushett’ site. Building face alignment is responsive to the existing roads configuration through a hierarchical series of primary and secondary edges expressed in rectilinear forms. In contrast, a radial object element acts as a counterpoint. learning accommodation with the larger L-shaped block addressing University Avenue and the new University Quadrangle. service or ancillary type accommodation within the smaller L-shaped block responds to the site indent created by the existing Western Infirmary pharmacy. the triangular atrium court reconciles the conflicting geometries imposed by the ‘gushett’ condition and becomes the physical and social core of the new facility. the study landscape/administration accommodation contained within a curvilinear form becomes the object building or icon for the new Medical School. The learning accommodation block re-instates the original urban grain of this site by forming a primary edge condition to University Avenue and a secondary edge to the Hortus Medicus quadrangle. All the Seminar, group tutorial, Clinical Skills and Communication Skills learning areas are housed within this block along with some academic offices and the common room. The façade to University Avenue is primarily of natural ashlar sandstone layered upon smooth white render. In contrast, the façade to the medical garden is primarily clad in smooth white render with some sandstone features and slot fenestration. The service/ancillary accommodation block forms a secondary edge to University Place and the pharmacy adjacent. Horizontal and vertical services distribution is concentrated within this block along with lifts, stairs, toilets, stores and some ancillary rooms (eg. actors and patients room). Fenestration is kept to a minimum and is expressed by a combination of vertical and horizontal window and louvre slots. Walls are smooth white render. 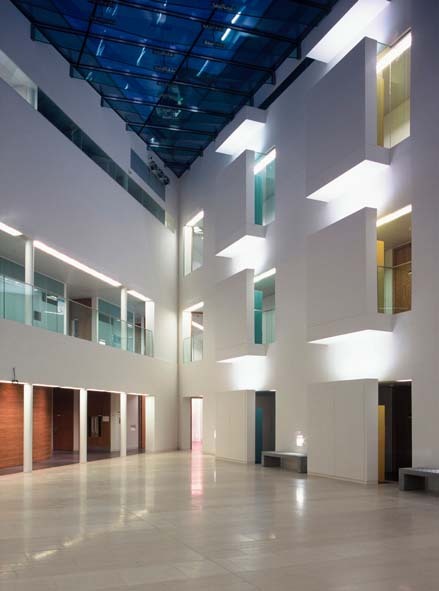 The atrium court is the social and physical heart of the new building. It is envisaged as a multipurpose space to cater for differing user requirements eg. informal functions, exhibitions, receptions, student forum etc. This space is capable of combining in a variety of ways with the common room and the seminar room’s foyer space dependent on functional requirements. 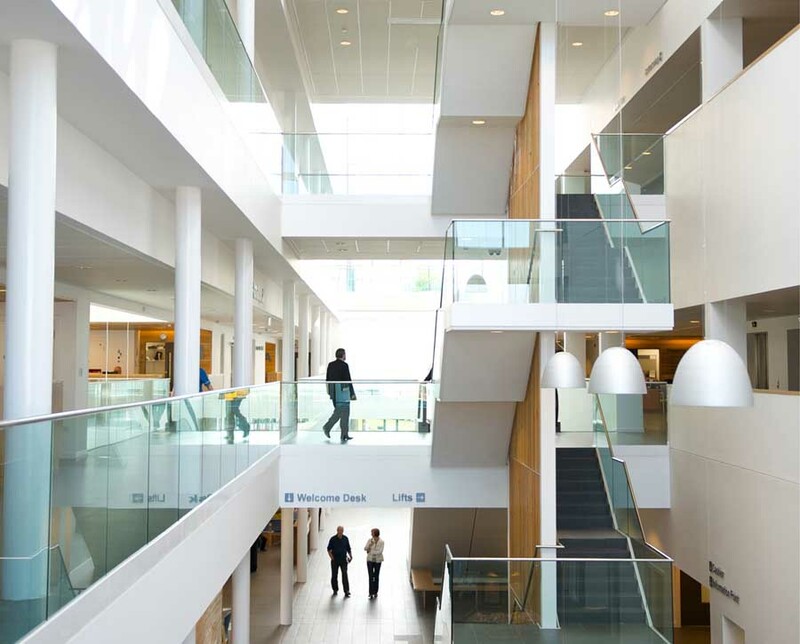 The circulation zones and accommodation interfaces adjacent to the atrium vary on each floor. At ground floor level, a colonnade acts as the interface between occupied space and the atrium. At first floor level, a glazed balustrade gallery surrounds the atrium void on two sides. At second floor level, learning accommodation rooms abut the atrium void. The service core accommodation on each level is effectively screened by projecting locker banks and informal seating areas. The study landscape curvilinear block acts as a powerful contrasting element to the rectilinear geometry of the other elements, and is envisaged as the iconic element for the new Medical School. It is located on the most prominent location within the available site ie. the apex of the gushett. The study and resource base accommodation occupies the top three floors of this block with the Dean’s Group office accommodation located on the ground floor adjacent to the main entrance. 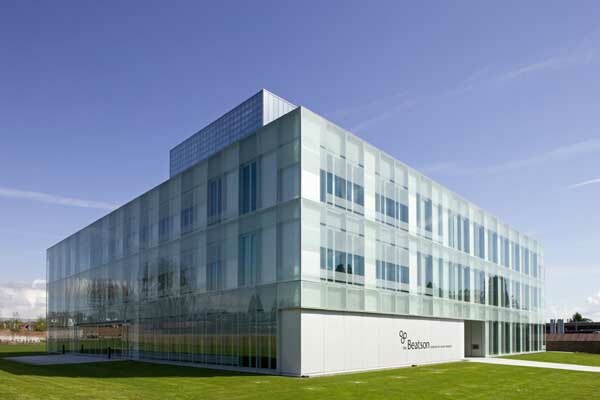 The architectural expression of this element is of a crystalline minimalist glass envelope with a projecting second glass skin acting as a solar control device. 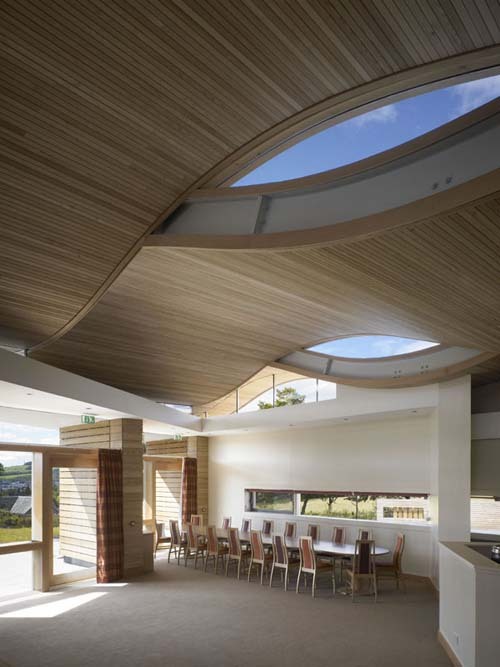 The use of glass as a primary structural material both for the atrium roof beams (which have varying spans up to 16m) and the cantilevered outer skin of the study landscape curved wall has proved to be the most significant design and construction challenge. The design philosophy is not restricted to the new building and its inter-relationship with the city. The landscaped spaces around and between the built forms are considered to be equally important, and consequently influence the internal spatial organisation. Two new public open spaces, each with a distinct character and purpose are proposed. The earliest botanic gardens established in Europe were collections of plants for education in university medical schools. The first botanists were all practising doctors. The physic garden of the University of Glasgow, established in 1704 and demolished during the 19th century, was very much part of the University’s history. Re-introduction of this tradition is proposed by providing a contemporary equivalent of the traditional Hortus Medicus, a garden to demonstrate plants useful in medicine. The Medics’ Corner links the Medical School with the wider urban fabric. 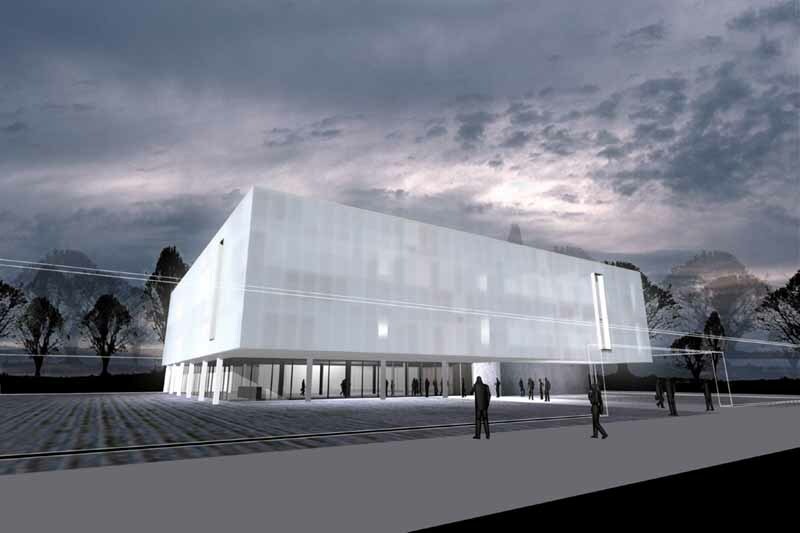 A proposed piece of public art will provide a focal point. Plant containers, trees and other street furniture will punctuate the plaza. The Medics’ Corner will become a central meeting point in the students’ university life and, in time, a key landmark along University Avenue. Construction work started on site in October 2000 and completed in August 2002. The contract value is £9m. 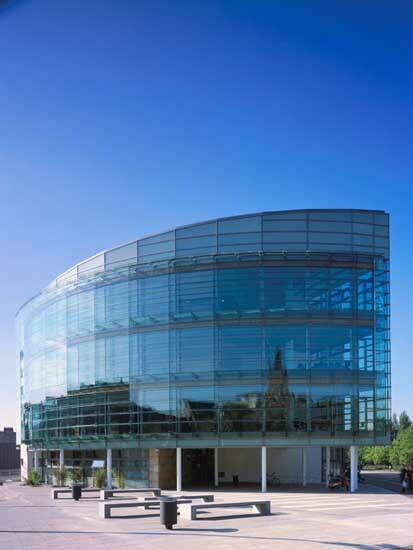 Following on from an RIBA award in the summer, the Wolfson Medical School by Reiach and Hall Architects for the University of Glasgow has now received a DYNAMIC PLACE AWARD 2003. The Dynamic Place Awards recognise excellence in the design and implementation of projects which enhance Scotland’s urban and rural environments. Now in their third year, these awards are an important catalyst towards improving and promoting the economy and environment of Scotland. This aim is promoted by the Scottish Enterprise and supported by Communities Scotland, Highlands & Islands Enterprise and Scottish Natural Heritage.